The Roland SDE-2000 Digital Delay offers complete flexibility over all the delay parameters including Flanging, Chorus and Echo etc. What are contained within the device are controls for Modulation (enabling sweep in the Flanger and Chorus modes) and Feedback which generates the signal for more intensity in the Flanger and Chorus modes, and provides multiple decaying echoes in long delay setting. 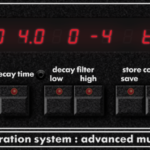 The Roland SDE-2000 Digital Delay offers a large capacity memory (12bit/16kbyte RAM) to provide low-noise and high fidelity sound through full band width. Delay time can be controlled by 1ms and it is displayed in the digital display.